I’m always on the lookout for great products. Partly because I scout items for lifestyle magazine Spaces Bay Area. And partly because it’s just fun. So here’s a fun one I came across recently – the Calibowl. Designed in the Bay Area, these bowls have a special “lip” at the top, that prevents food from spilling over. Imagine your kid is scooping salsa from a bowl. Okay, I take that back. My kids wouldn’t touch salsa. Imagine they’re scooping yogurt or oatmeal from a bowl, and they get to the top of the bowl with their spoon. In many cases, that food goes over the edge and onto the table (or floor, or lap…). With the Calibowl, the lip helps the food make it onto the spoon, without spilling over. 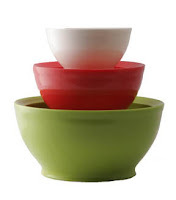 The bowls are plastic, but attractive and in fun colors. In the future, the bowls will come with rubberized bottoms (I like the sound of that), to avoid table slippage. And they’re dishwasher and microwave safe. They’re not yet in stores, but you can order online (a set of three sizes costs $30). please support the calibowl if you do you will be supporting less fortunate families and many charities.